The city itself is a really easy place to navigate. Google maps does the job quite well, but in addition to that the locals are really friendly and English isn’t much of a challenge for most. You’ll find a lot of the local businesses even use English on their menus and storefronts. Getting data on your unlocked phone is pretty simple. At the airport there were a few people giving away free SIMs. You still need to top them off, but 5 euros will give you 500 mb which is more than you’ll need for a weekend. There were three walking tours all run by the same company. I definitely, as always, recommend you do them if you have the time. I’ll leave a link below to the one I went to and you can give it a try when you arrive. All you need to do is show up. I met my new friends after the first walking tour I went on during the first day of arriving. It kind of started when one of them first asked where I was from and what was I doing traveling. It’s usually a bit of a surprise when I tell people I work in London. Following up with things like, “That’s so cool,” or, “That’s so brave.” It’s generally pretty uncommon to find people from North America (Canada or the States) move away from the country for work. I’d say even from my graduating year of high school, I only know a handful of people who’ve moved out of the country. This is probably why when I find someone with a familiar accent anywhere, I get pretty excited myself! It’s like, “Finally someone who might actually understand my English!” After the walking tour we ended up hanging out at a cafe and talked for hours about what it’s like back at home. Comparing differences between growing up in Toronto versus San Francisco. It kind of all boils down to something that’s like the TV show “Fresh off the Boat.” After our little introduction session, we headed off to grab some lunch at this amazing seafood food truck. The lineup was massive! Clearly a huge tourist spot but well worth the wait. I ended up ordering a lot; as I normally do while travelling. All of this was to prepare for our next walking tour. After the walking tour I ended up joining them for dinner at a restaurant they had booked. The restaurant was called the Pelikan. I was absolutely stuffed by the end of this meal. Before we sat down to eat though, we did run into a bit of trouble with the reservation. There was another group of Asians who were eating at the restaurant who had stolen our reservation. Here’s what I think happened. Thi s group of Chinese tourist came to the restaurant and don’t speak English very well. The host probably asked if they had a reservation and they said yes. Host probably saw some Asian name on the list and they probably agreed that was them. When we arrived I noticed my friend’s name was already crossed off as if he had arrived. Luckily it was early enough and there was a free table available. But, seriously. During our little lunch at the seafood food truck, Nystekt Stromming, we met an old couple who were local to Stockholm. The husband told us of how different the city was in his younger days and how much has been built up since then. I did ask them about where I could get really good meatballs. Here’s the kicker, though meatballs are a pretty big thing in Sweden, it’s not exactly something Swedes see as being their national dish. From his perspective, meatballs were always something you’d have at home. 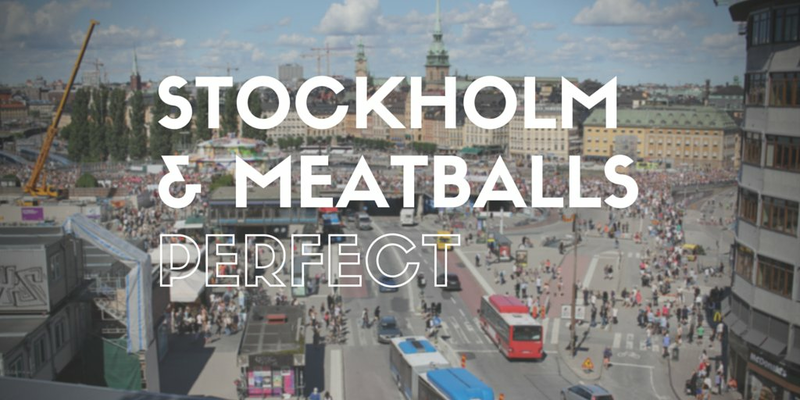 The wife told us that they even have a nickname in Sweden which translates to, “Mother’s meatballs.” Apparently it was something moms would make at home for their families, which means there is no particular traditional way to make them. That being said, IKEA meatballs are just IKEA meatballs. The variety of meatballs I had while in Sweden was plentiful! Originally I had planned to go to IKEA. However, I ended up not having enough time to go. Though, I don’t think it was a huge miss, considering I was only planning on going there for the meatballs. There is a bus though, from the city centre that will take you there. It’s literally a bus outside of central station that says IKEA on it. It’s a free shuttle, so if you have time it might not be a bad idea. The area where IKEA is, is actually a large outlet centre with shops and restaurants. Probably not a bad area to go if you’re looking to do a bit of shopping. On my last day, I ended up going to a museum and another park that has some similarities to “Pioneer Village” in Toronto. The museum I ended up going to check out was the Vasa museum. It’s pretty cool. It’s literally a museum that’s been built specifically to house one boat from the 17th century. The history behind the boat is something similar to Titanic but probably worst. It was one of those boats made to awe everyone. However, literally minutes after it had set sail, a bit of wind tipped it over and it sunk to the bottom of the lake near the port. It was under water for a very long time so a lot of it was destroyed. The boat they have in the museum has a lot of its original parts, but they reconstructed a lot of. There’s a mini cinema that plays a History Channel like video that explains it all. The rest of the museum is filled with treasures and remnants of the boat that are put on display. There is an English tour available as well. It’s short but well worth it. The most incredible part were the tour guides. Almost all the tour guides and some desk staff were multilingual in 4 languages; English, Swedish, French, and Spanish. Most announcements were done in those four languages as well. After spending a couple hours in the museum, I headed off to my next stop. I made my way to Skansen. It’s literally within walking distance from the Vasa museum. So, if you have time I would definitely say do both in a day if you can. Skansen, is a park that recreates the original village like life of the area way back in time. You can visit houses made from lumber and logs with actors who play their part as bakers, glass makers, school teachers, gardeners, and much more. At one of the houses I visited, I got some fresh bread made in some sort of stone baked oven. It was really good. The park does also double as a zoo. It cares for a number of animals. They range from large felines, owls, reindeer, wolverines, seals, and more. Though it was fun to visit, I think it would have been a lot better had I gone during one of the annual festivals at the park. I was told it’s a lot more lively and the place is generally better kept leading toward those dates. After spending a few hours in the park it was time for me to head back to town and grab my train to the airport. OK, thats all pretty awesome!